For more information about this Proven Safety Countermeasure, visit the Office of Safety's USLIMITS2 website. "USLIMITS2 acts as an external, impartial, second set of eyes." 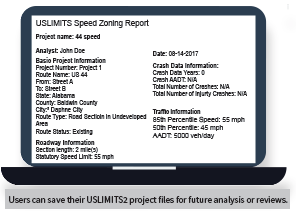 USLIMITS21 is a free, web-based tool designed to help practitioners assess and establish safe, reasonable, and consistent speed limits for specific segments of roadway. It is applicable to all types of facilities, from rural and local roads and residential streets to urban freeways. USLIMITS2 supports customary engineering studies2 used to determine appropriate speed limits. These studies typically include evaluating criteria such as 85th percentile speed, traffic volumes, roadway type, roadway setting, number of access points, crash history, pedestrian/bicyclist activity, etc. Similarly, USLIMITS2 produces an unbiased and objective suggested speed limit value based on 50th and 85th percentile speeds, traffic volume, roadway characteristics, and crash data. 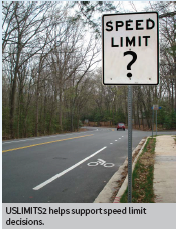 Traffic engineers often communicate with the public, community leaders, and government officials to explain the methodology behind setting speed limits. USLIMITS2 provides an objective second opinion and helps support these speed limit decisions. USLIMITS2 augments the credibility of engineering speed studies, helping to address concerns from local government officials and private citizens when speed limits are adjusted. To begin using USLIMITS2, users create a new project or upload an existing project file for revisions or updates through the online tool. The website contains the user guide, information on the toolâ€™s decision logic and related research, and frequently asked questions. 1 USLIMITS2 is available free online at https://safety.fhwa.dot.gov/uslimits/. 2 For more information on setting speed limits based on engineering studies, refer to the Manual on Uniform Traffic Control Devices.